The first thing you should know is the FE, or FRONT END offer is for a collection of animated graphics in .SWF format (or FLASH files). So if you work predominantly in PowerPoint or Explaindio, these are exactly what you're looking for. However, if you're like me, and do a large part of your editing in a dedicated editing program such as Screenflow, Camtasia, you're going to want to get the first OTO, because that will give you the added benefit of having these same assets as animated GIFs as well as static PNG files. .
bomb blast • the list goes on... there's even a "LOVE IT" and a "HATE-IT" meter, which is pretty cool. By the way, the OTO also includes a great collection of eyes and mouths, so you ca animate inanimate objects and make them talk and blink… so there's another great reason to upgrade to the OTO. In addition to the animated GIFS, you also get a holiday package which will come in handy at the time I am recording this review. And there you have it… Definitely get the OTO, so you can have a choice of formats. 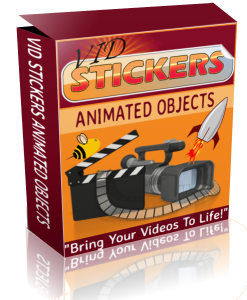 Overall, VidStickers is an outstanding and fun addition to any video maker's arsenal. Almost broke the indicator on my meter... LOVE IT!!! Early Bird Pricing Starts Saturday 12th December at 1pm EST Use Coupon "launch5" to take $5 Off at Checkout! I almost forgot to tell you... when you buy VidStickers, you also get these Bonuses!!! Six fully customizable PowerPoint templates for your to edit to your liking, or simply use as is. You can edit text, background colors or images, shapes and pretty much everything on the Template to make Video Outros completely unique to you! Export as a video and add to the end of any existing video for a strong Call To Action. PLUS my awesome Bonus Package below! A set of 20 background music tracks, perfect for giving your videos that extra sensory element and an air of professionalism. Two sets of fun holiday themed Video Outros with space for branding. Add to any of your videos with your favorite video editor for a strong but fun Call To Action. Includes 12 x Outros with calls to action including “Connect With Us On Facebook”, “Visit Our Website Today” and “Subscribe To Our Channel”. This set of 20 Premium Motion Backgrounds are perfect for using as backgrounds to your videos. Some motion backgrounds are completely out there and over the top and frankly unusable, but these are subtle and classy, and you will find yourself turning to this collection over and over! Use for your own personal and client projects. For your convenience, all of the Bonuses above will be available to you in the VidStickers Members Area immediately after your purchase.